So this is not authentic Thai food, but there are some delightful Thai flavors going on. 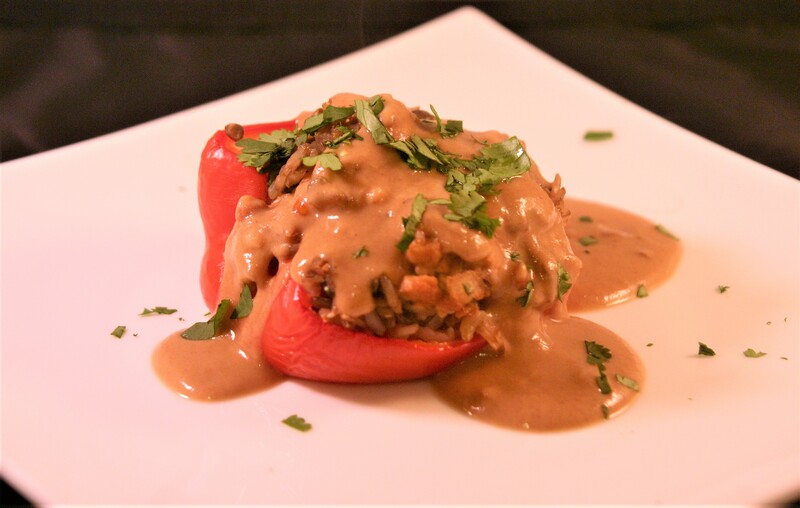 These stuffed peppers have a mixture of rice, lentils, and vegetables set off with some Thai red curry paste, and topped with a comforting peanut sauce. Super tasty, gluten free, vegan, easy, and comforting. This recipe was developed in my quest to try new things and was inspired by my wonderful mother-in-law makes super yummy stuffed peppers (and has made me vegan ones because she’s awesome). I wanted to do a stuffed pepper, but take it outside the box a bit. Mix rice, lentils, and mushroom broth in a medium pan. Cover and bring to a boil over medium heat. Reduce heat to low and cook, covered, until rice and lentils are tender, about 30 minutes. Prepare a large baking sheet by lining it with a silicone mat, parchment paper, or aluminium foil. Place peppers on baking sheet cut side up and bake for 20 minutes until starting to soften. While peppers are cooking cut your vegetables. Add olive oil, onion, squash, and mushrooms sauteing until tender, about 7 minutes. Add lime juice, salt, and garlic cooking 1 additional minute and remove from heat. Stir together the cooked rice and lentils, the vegetable mixture, cilantro, and the red curry paste. Add the curry past a teaspoon at a time and taste adjusting to your preference. Once peppers have cooked remove them from the oven and fill with rice mixture to overflowing. Cover with aluminum foil and bake 20 minutes until cooked through. While peppers are cooking make peanut sauce. Serve hot with peanut sauce and garnished with cilantro. Once boiling whisk in peanut butter until smooth and remove from heat. Stir in brown sugar, tamari, lime juice, garlic, and red pepper flakes. Taste, and adjust seasoning to your liking. Add in cilantro if using and serve immediately.